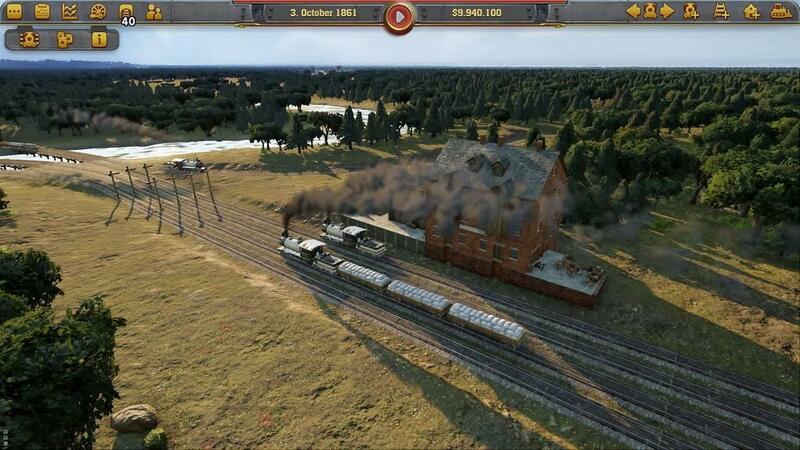 The first thing you’ll notice when starting up Railway Empire is the substandard graphics. I have to say that through the many hours of gameplay, I kept thinking that better graphics would help immensely in making this game work. This gets compounded when you try to make heads and tales of some of the user interface choices (more later). The game then quickly throws you into the fray – giving you simple tasks that may or may not be all that obvious to complete. The idea that this is a “make a track and move to the next city” becomes quickly erased when you realize how deep this game really is. The game is played out with the same strategic thinking as most of the Civilization games but unfortunately does so without walking players through how to do things. 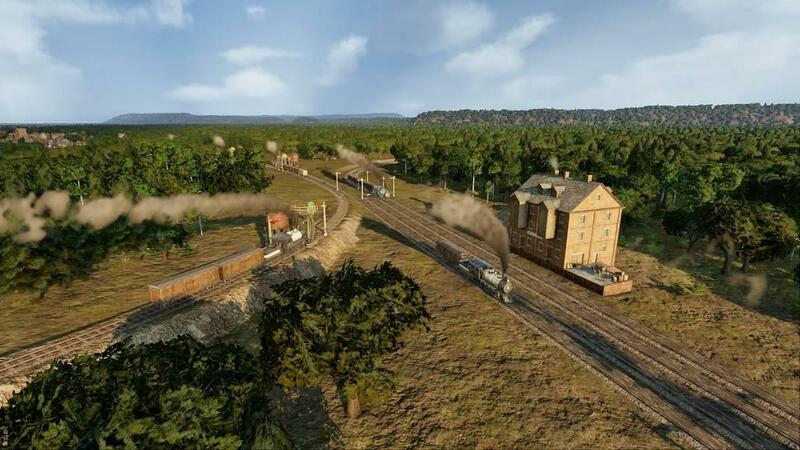 Railway Empire sets you up in time periods specific scenarios letting you decide where to build, how to build, which way to go, and how fast to get there. The game progresses through periods at 2 speeds – a slow mode for designing, and a fast mode for earning money. 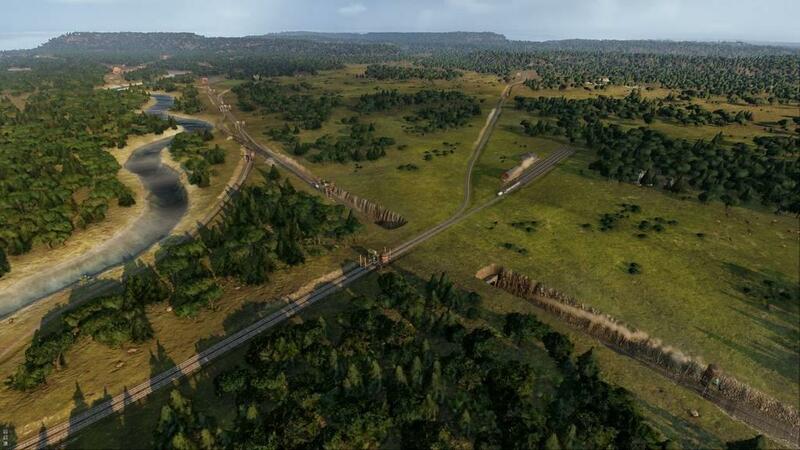 Railways are set up by picking which cities the trains go through, what they will carry, and how fast they get there. 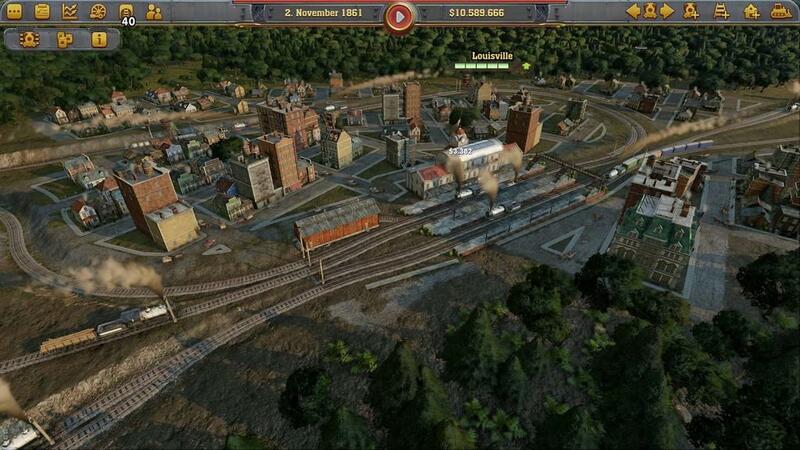 The trains can move people, food, lumber, and other goods in direct correlation to what the city currently needs. 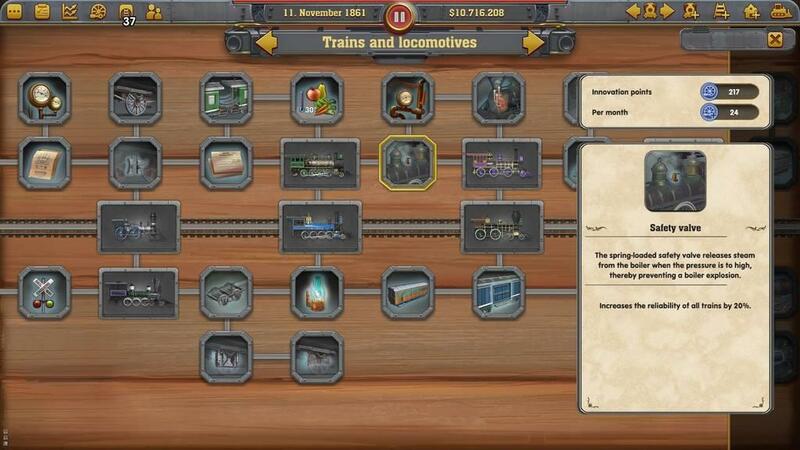 As the game progresses, you will have to work with keeping the trains running smoothly. 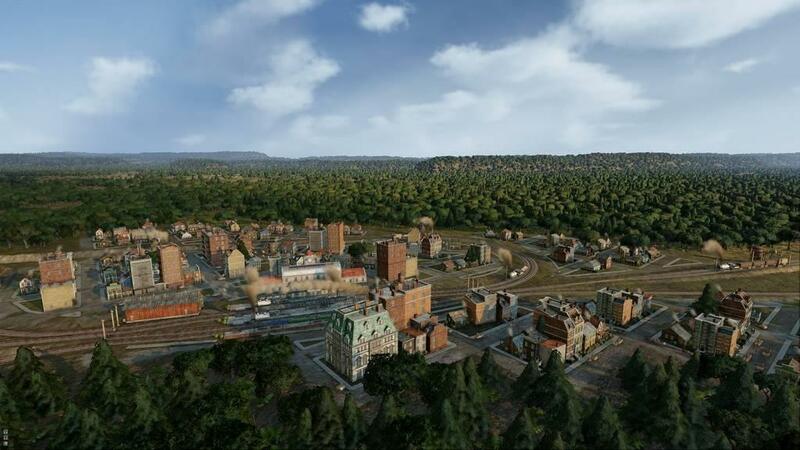 This happens by making sure stations are big enough; have enough supplies for each track; have maintenance buildings; and better trains replace old ones as needed. This also happens through a research section that allows you to add innovations to the trains to make them better – i.e. cow catchers, cabooses, upholstery, and much more. These can be bought as you get innovation points given at intervals during gameplay. This is easily the most informative and enjoyable menu the game offers. Much further into the game, you will get into hiring employees, competing with other railroad owners, auctioning for businesses and innovations, and buying stock in your competitors' business. The game goes from a Little Tikes trainset to a full-size Amtrak in a matter of hours. Keeping up with who is building where, what your equipment is doing, and how fast to expand can actually be quite an extensive designing model. The game does not do this in a very user friendly fashion. The menus are very poorly laid out. There were many times where I was fumbling with a dozen menus just to figure how to do something. 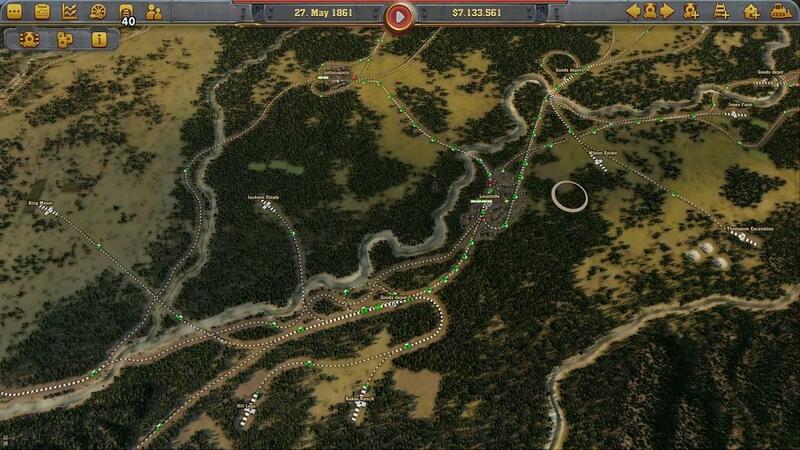 For example at one point I had purchased seven trains I didn’t need trying to figure out how to get routes set up. The track system is absolutely out of a game from 1997. It doesn’t give that much control; is overly complicated, is graphically substandard, and does not give that much instruction to do jobs correctly. There was a stretch of time where the game wanted me to do something and I couldn’t figure how. Without going on-line to look for answers, it took over 15 minutes to do and it was a very routine thing. The employee system is problematic as well. 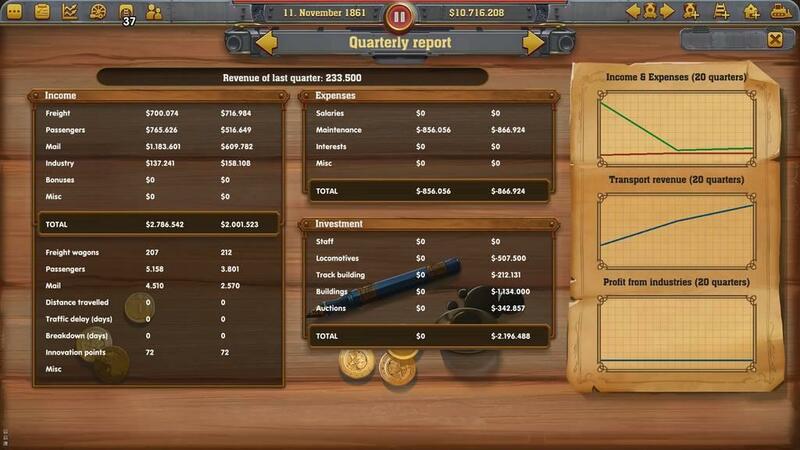 There are options to buy employees during play but they all have duplicate pictures, do not say what train they are working on, and their salary makes little difference when you are making 15 million. So you can put Charlie Thompson on train X for $450/week, and then select another train and put him on that one too – only to remove him from a train he is already on. It becomes more difficult as the ability to change from one train to another to check employees becomes a frantic button mashing event until you get to the right train, right position and right replacement. I cannot stand games that require you to have a notepad handy because the designers didn’t put in some way to track important info. After a while I refused to care. Remember I said “more later” about the graphics? Well, here we go. 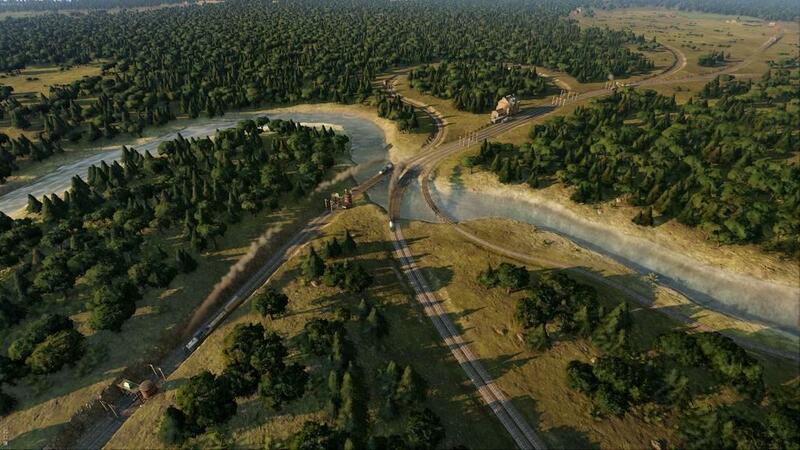 The graphics make it difficult to tell where tunnels, bridges, inclines, and other details are. Clicking on trains, cities, and other landmarks are also hit and miss. Figuring out what landmarks and buildings each city has is also a guessing game and there is little explanation to why some things can be built and why they can’t. The game graphically looks like a “beta” test rather than a finished product. The story to the game is lacking as well. There will be a famous person giving you snippets here and there, but the way to continue to a new part of the game falls to simply completing the list of tasks to move on. For me, it seemed impossible to fail. In one scenario I was doing poorly, finished in third place, and still passed with a reasonable rating at the end. There really is no losing beyond letting time pass by without doing anything. Probably the worst “flub” with the game is the ability to decide what is transported from each city and business. 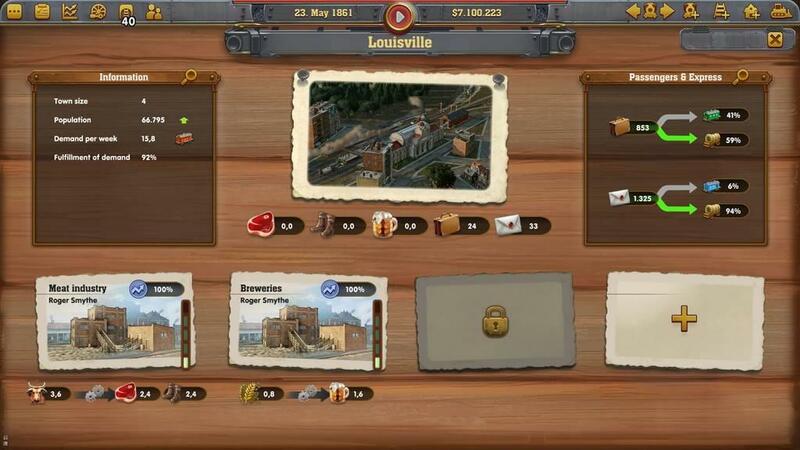 Some of the tasks ask you to send certain things to certain towns. This was ridiculously under-explained and became aggravating at times. There are little menus within menus that give no instructions and it becomes a guessing game til you get it right. Considering it is one of the more important things in the railroad industry, you’d figure it would be easy as pie to use. Um.. No. 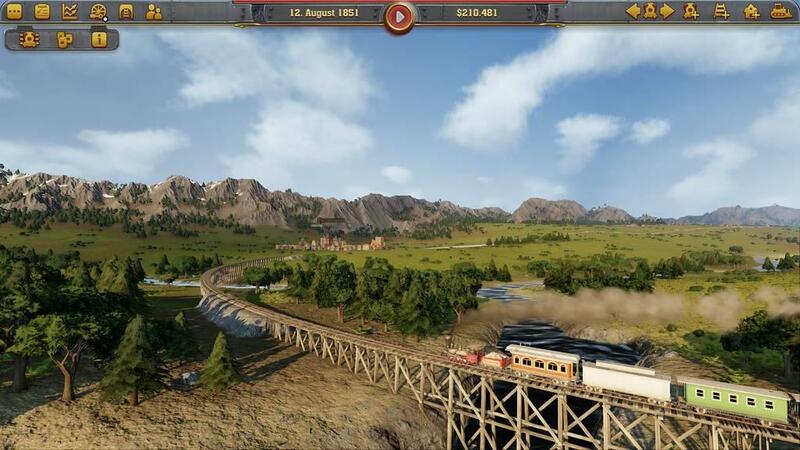 Train enthusiasts will try to love this game with fervor. 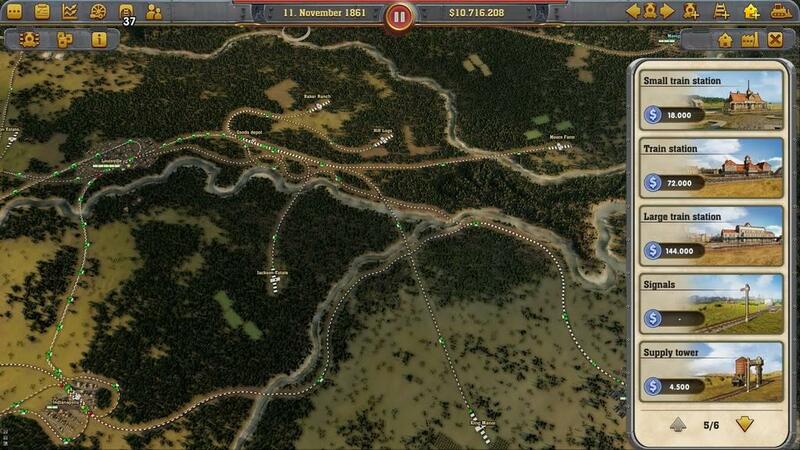 It really seems to simulate early American train management. Regular gamers, however, will easily become annoyed with the application of the game. More than that, they will be annoyed with the lack of challenge to the game. I really would have to work hard to fail. It isn’t like Civilization where there are FIVE ways to win and hundreds of ways to lose, there is no winning or losing in this game. I think there is a lot to work with here. 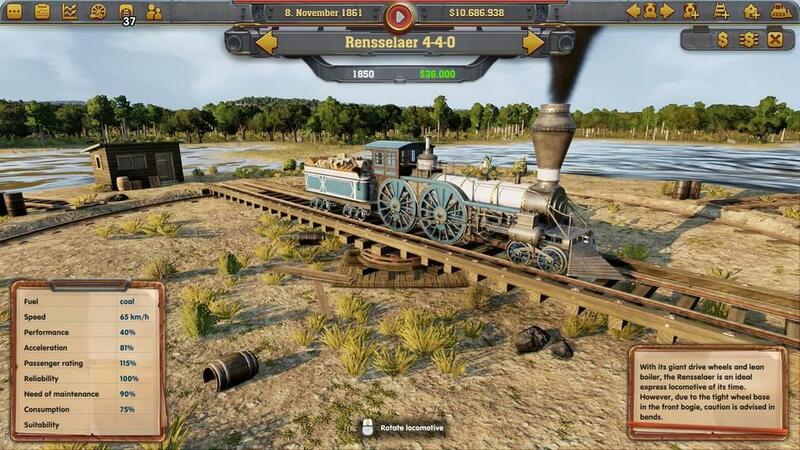 Railway Empire is a game that has a lot of promise, plenty of substance, and can be enjoyable to those who have 20ft train sets in their basements. However, most will find this game poorly designed, easily finished, and a tedious use of their time. Suddenly doing laundry sounds like a good idea. I am a graduate of West Liberty University with a B.S. in Business and a specialization in Computer Information Systems. I am married with one son who is 15. Gaming has been a staple of my life since early on - playing basic games on a Texas Instuments home computer. Since then I've played on just about every system thereafter and some PC games as well. As someone who is disabled, I have a lot of time to put towards gaming and reviews. Mass Effect 2, Gears of War 2, and MechWarrior are among my favorites.